Summary: As we head into the winter months, our access to fresh green garden produce becomes limited. Sprouting is a great solution! As we head into the winter months, our access to fresh green garden produce becomes limited. We will become dependent on greens shipped from far off regions with depleted nutritional content. Many of us living in northern climates do not have access to a heated greenhouse during winter to help enhance our diets with fresh nutritional greens. But there’s an easy way for anyone, even those that live in condos and in the city, to grow their own greens: growing sprouts. Don’t be fooled by their size. Sprouts, although small, are high in nutritional content and can supply an abundant amount of nutrition to your diet not only in winter months, but throughout the year. Add them to salads, sandwiches, wraps, smoothies, dips, stir-fries, and even soups and stews. Use often and if possible at every meal! 1. Select the sprouts you would like to grow. Choose a variety of sprouts, since each sprout comes with different nutritional content. 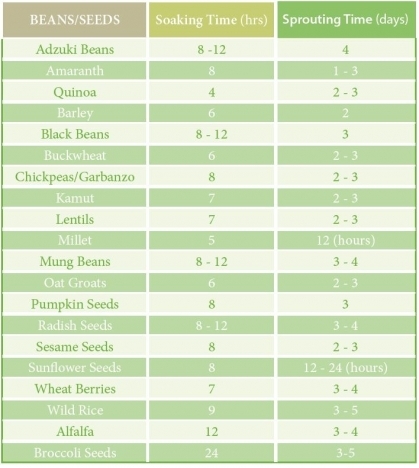 Adzuki beans, green lentils, alfalfa seeds, French green lentils, chickpeas, and mung beans are just a few of the easiest options to sprout. Ensure you keep each sprout type in a separate container, because they each have a different germination rate. 2. Rinse and pick over the beans. Use whole and untreated beans. Be careful to select high quality beans that are meant for sprouting and eating. Contaminated beans can cause illness. Wash and remove any damaged beans and foreign objects. 3. 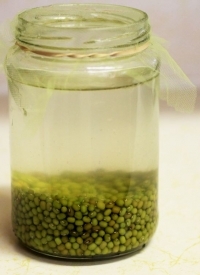 Place beans in a jar with water. The beans will expand as they soak, so give them plenty of space in the jar. For example, you only need two tablespoons of alfalfa seeds for a 3-cup jar. Other beans should not take up more than ¼ of the jar. 4. Cover the jar with a drainable cap. Be creative: you can use cheesecloth held by an elastic, or a piece of mosquito netting held by a jar ring. Otherwise, you can purchase a commercial jar sprouting lid with a mesh top. 5. Soak the beans. Let the jar sit for 8 to 12 hours at room temperature. In general, the larger the bean, the longer the soak. 6. Rinse and Drain. Drain the water out through the mesh cap completely, then rinse with fresh water and drain again. Place the jar upside down at an angle, somewhere out of the sun. Use a dish rack or wire cooling rack so that any remaining moisture will escape and air can circulate around the opening. 7. Repeat. Rinse and drain the beans with fresh water two to four times a day. Be sure to watch that your beans do not dry out. Continue until the sprouts have grown to the length you want. Alfalfa sprouts should grow to about an inch, whereas Mung bean, lentil, chickpea, and adzuki sprouts are ready to eat at around half that size. 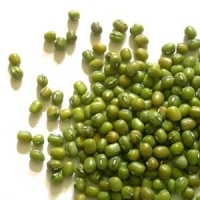 Lentils and mung beans usually only take a couple of days after the initial soak. 8. Use immediately. Since sprouts perish easily, consume them within 3 days. This shouldn’t be too hard, since the meal possibilities are endless! Use sprouts fresh in salads, or make plant-based “milks.” The soaked and rinsed beans are great to cook. If sprouting grains, use in any of your favorite recipes just as you would unsprouted grains. Nut sprouts are great dehydrated, but take caution as nuts develop mold if they are not completely dry. Add dehydrated, sprouted buckwheat to your breakfast for extra crunch. It only takes 24 hours for buckwheat to sprout, and after dehydrating, the buckwheat will keep in sealed jars for some time. Buckwheat is high in nutrients and especially beneficial in strengthening the vein and artery walls. Now you’re ready to begin your sprouting journey. But take heed: contaminated sprouts can result in bacterial growth such as E. coli, leading to food-borne illnesses. Always purchase organic, fresh products from a reputable source. Wash hands thoroughly before handling foods, and keep sprouting equipment and all kitchen surfaces clean to avoid cross contamination. Always consume sprouts within a few days, fresh and straight out of the fridge. Refrigerate sprouts once they reach their desired length. Some health organizations also recommend consuming them cooked to reduce the risk of infection. -To increase nutrition content of meals especially during winter months. -To enhance your diet, increase your nutrition, and add healthy greens to your diet without breaking the bank. 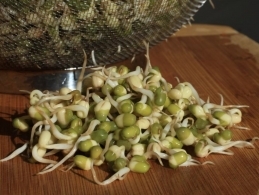 Seeds and beans are inexpensive and can yield an almost exponential amount of nutritional sprouts. Sprouts are one of the most economical foods. -To be prepared for natural catastrophes that might leave you without food and cooking facilities. 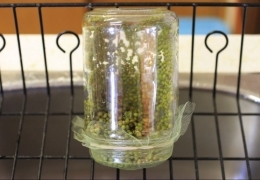 Store dry beans and seeds for sprouting in a disaster. All you need is some water to sprout. -To increase the variety of your diet by incorporating different beans that you might not otherwise consume. -It requires very little equipment, and can be done anywhere. No garden required. Janie Unruh is a health professional and a contributor at Amazing Health.